What is Connective Tissue in Meat? There are a few types of connective tissues in meat. There's the obvious kind, like tendons, which connect muscles to bones; and ligaments, which connect bones to each other. Then there are those sheets of white fibrous tissue, called silverskin, that surround whole muscles. Finally, individual muscle fibers are also encased in connective tissue, although it's less visible. Not only do connective tissues have different functions, they're also made of different materials that behave differently when cooked. There's elastin, the protein that makes up silverskin and ligaments. This is the stuff you think of as gristle. No matter how it's cooked, elastin will be chewy and rubbery. The best thing you can do is to remove as much of it as possible before cooking. Then there's a protein called collagen. To find it we need to zoom into the level of the protein cells that make up the meat itself. Meat is made up of long cells called fibers, and each individual muscle fiber is wrapped in a sheath made of collagen. The individual fibers are in turn grouped together in bundles, with each bundle also wrapped in a collagen sheath. While the individual muscle cells (fibers) are too small to see, it's these bundles we distinguish as the grain of the meat. If you've ever seen a recipe that instructed you to slice the meat against the grain, these bundles are the grain you're slicing against. The job of these connective tissues is to pull the bones when the muscle fibers contract, so they need to be strong. And the more work a muscle does (like muscles in the legs and shoulders), the tougher those sheaths need to be. Muscles around the back and ribs, which get less exercise, have less of this type of connective tissue in them, which is why they're naturally more tender. Like elastin, collagen is tough. If you tried to eat a piece of raw beef, it would be extremely chewy, because those collagen sheaths around the muscle fibers would all be intact, but unlike elastin, collagen can be softened and melted away if it's cooked in the right way. When heated to between 160 F to 205 F, collagen will start to melt away. What happens is that the collagen breaks down and turns into gelatin, which is soft and jiggly. This doesn't happen right away — in fact, it can take several hours. The key is to keep it within the range of 160 F to 205 F, which is easiest to do by cooking it in liquid, which is a technique known as braising. You can also do this in a smoker or barbecue, but it takes a lot more skill and attention. By comparison, braising is pretty foolproof. Cooking meat to 160 F or higher causes the muscle fibers themselves to become tough and dry. You know this if you've ever had a steak that was cooked well done. The cuts of meat we use for steaks don't contain as much collagen, which is why they can be cooked very quickly, to an interior temperature of less than 140 F, and still is tender. With collagen-rich cuts of meat, even as the muscle fibers themselves become tough and dry, the collagen around the muscle fibers starts to melt away, coating the muscle fibers with gelatin, giving the meat a moist and succulent texture in your mouth. Additionally, the bundles themselves start to loosen up once the sheaths holding them together have softened. Thus, even though the muscle fibers themselves are tough and dry, the meat itself will seem tender and succulent. 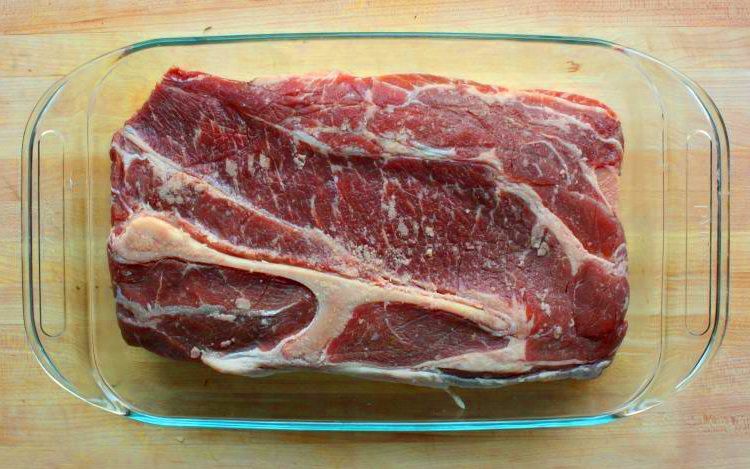 This is truer of collagen-rich cuts of meat like beef chuck than ones from the rib or short loin. Another way to tenderize tougher cuts of meat is to physically break up those collagen sheaths by pounding the meat with a meat mallet. This allows the meat to be cooked quickly. Contrary to popular belief, however, marinating does not tenderize meat. Incidentally, another thing that happens when meat is slowly braised is that the fat within and between the muscles also liquefies and coats the muscle fibers. This contributes even more to the sensation of succulence in braised meats. Thus, you can definitely braise tougher cuts of meat from the rear of the animal, like rump roast (i.e. bottom round), and the collagen will indeed break down. Since the beef round is much leaner than beef chuck, braised rump roast won't be quite as succulent as a braised 7-bone chuck roast. If you've ever had beef tendon soup, which is a standard offering at Vietnamese noodle restaurants, you know how wonderfully gelatinous a braised beef tendon is, and also how satisfying the gelatin-enriched broth is. Finally, while it's not a connective tissue per se, cartilage is another source of collagen. When simmered, the cartilage in bones breaks down into gelatin, which gives incredible body to stocks and consommés. The bones of younger animals contain a lot of cartilage, which eventually turns to the bone as the animal ages. That's why veal bones are particularly prized for making stock. Chicken feet are almost pure cartilage, making them excellent for making chicken stock.